“Health, Food, Sea, Medieval Villages, and Stunning Ruins”. Since the New York Times listed Calabria among the most beautiful places in the world, “Calabria Mania” has exploded. Direct flights to Lamezia Terme connect Calabria to the major European capitals and Canada. Calabria is like Magna Graecia (Great Greece), the heart of the Mediterranean Sea, especially known for its coastline and the beauty of the sea. The Riace Bronzes were restored and are now preserved at the Magna Garecia National Museum in Reggio Calabria. Calabria received international recognition for its 800 kilometres of coast with the Bandiera Verde 2018. Home of the Mediterranean Diet, Calabria was able to attract Lidia Bastianich’s attention, the global icon for good Italian cuisine throughout the world. Lidia decided to write a recipes collection inspired by her culinary trip around Italy, revealing Calabria’s real identity: a territory to explore, which has preserved its values, its rituals, and its flavors intact. Thanks to chefs that combine innovation and traditions, these Calabrian flavors are recognized globally. Calabria by boat and more. If you are thinking about a boat trip around the Calabrian coastline, several ports are ready to host you throughout your journey. where, between ancient ruins the old Cirella’s Amphitheatre o_ers many shows during the summer season. Diamante is also well known for its Festival del Peperoncino, which runs in September. Moving further south, Guardia Piemontese is the perfect location for the Terme Luigiane, famous for the abundance of sulfur, mud, and white algae in its waters. Close to Gizzeria is Terme di Caronte, a thermal complex built in a place where sulfur waters have been flowing for thousands of years. Also, on the Tyrrhenian Coast, the Coast of Gods o_ers well-equipped ports for boating in Vibo Valentia and Tropea. This is the area where Nduja and the Tropea IGP red onions are produced. In Nicotera, Professor Ancel Keys named the food style which we now call the “Mediterranean Diet”, recognized as Unesco Intangible Heritage. And further south, Violet Cost is the area where Sword fish have been caught for centuries using traditional boats for to find and catch the big fish. Here, the Torrone di Bagnara is made following the traditional recipe used since the 1700s. On the Ionic Sea side, the Jasmine Riviera is one of the most secret and unexplored Calabrian coasts with turtles nesting there. In Roccella, the Festival Roccella Jazz (celebrating its 39th year, is held during the summer with some of the most famous jazz musicians among the participants. Badolato features a small touristic port and its medieval village is located on the Orange Coast. Here, between caves and ravines sea horses live and reproduce. The Museum of Fishing and Sea in Montepaone welcomes and cares for wounded turtles and dolphins. On this coast, in Roccelletta di Borgia, is the Archeological National Park of “Scolacium”. 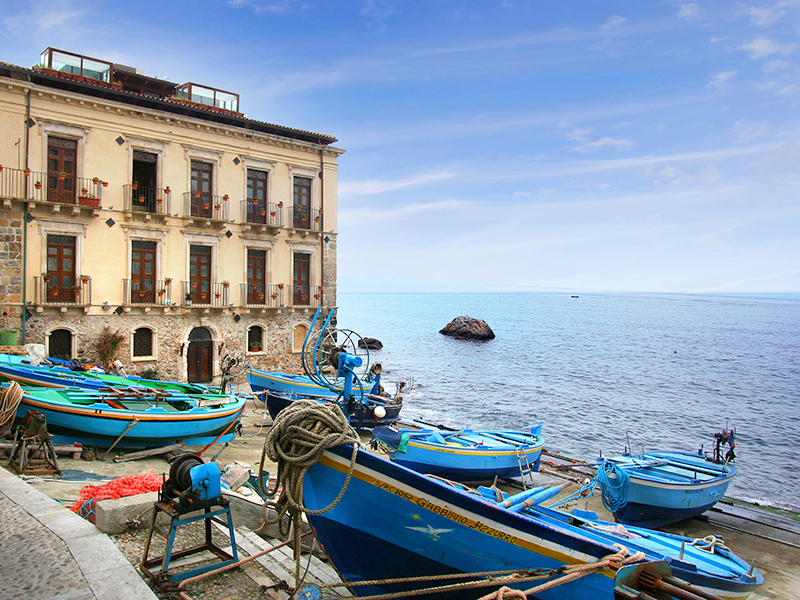 Located at only 200 metres from the sea, it hosts the international festival called “Armonie d’Arte” during the summer. The Saracen Coast on the Ionian Sea is synonymous with good wine and archeology from the Marine Reserve of Capo Rizzuto. In Capo Colonna, past Le Castella, you will find the Aragonese Castle in the sea where Monicelli’s “L’Armata Brancaleone” was filmed. The ancient breeze of the myth blows on Crotone, the city of Pitagora, where every year the Italian Sailing Championship is organized by the Sailing Club and o_ers activities for adults and children throughout the year. According to Eric Asimov of The New York Times, in Ciro’ there is one among the twelve rarest and most valuable vineyards in the world, the Gaglioppo, of which he described as “…rustic reds, with aromas of roses and smoke and grippy tannins”. Robert Camuto on Wine Spectator wrote: “Will Ciro’ be the next most popular Italian wine?”. Further north on the Ionian coast, the Achaean Coast o_ers large beaches suitable for families with children. From here you can reach Cerchiara di Calabria, where from a narrow canyon in the heart of the Pollino Park gush the thermal waters of the “Cave of the Nymphs” whose sulphurous waters feed a thermal spa with mud known to the ancient Sybarites. According to the early legend, this was the cave that held the thalamus of the mythical nymph Calipso. Inland, Calabria has a lot to o_er travelers who are interested in discovering all the customs, history, rites and faith, and to taste organic food, at zero kilometres, in landscapes modelled after ancient agricultural methods and respectful of nature. Combining nature and spirituality, those who love hiking can experience the “Way of San Francesco of Paola” and retrace the steps of one of the most beloved saints, as well as hike the Sentiero del Brigante from Aspromonte to the Serre Vibonesi. Another walking trail is dedicated to Gioacchino da Fiore, a philosopher who lived during the Middle Age between 1100 and 1200 and opposed the crusades in the belief that humanity was on its way to an era of peace, justice and dialogue.